including the analysis, enforcement, and prosecution of patents. with complex IP litigation in a variety of federal jurisdictions. Colin’s practice integrates multiple disciplines of IP law, including the analysis, enforcement, and prosecution of patents. "Detroit Patent Office Opens Its Doors," written for the Fall 2012 edition of Business Casual, published by the New Lawyer's Committee of the American Intellectual Property Law Association. E. Colin Cicotte attended the State Bar of Michigan’s annual Spring Intellectual Property Conference. Colin’s practice integrates multiple disciplines of IP law, including the analysis, enforcement, and prosecution of patents. He develops and manages global IP portfolios for large corporate clients and has extensive experience with complex IP litigation in a variety of federal jurisdictions. Colin regularly works with electrical, electro-mechanical, mechanical, and computer technologies. He has prepared and prosecuted patents involving hybrid electric vehicles, wireless telecommunications, vehicle telematics, photovoltaic units, electrically operated cam phasers, and ignition circuits. These patents have been prepared and prosecuted not only for large corporate clients but for universities and individual inventors as well. Colin received a Bachelor of Science in Electrical Engineering from Wayne State University. He also graduated from the University of Michigan with degrees in Economics and History and received his juris doctorate from Wayne State University Law School, where he was a note editor for the Journal of Law and Society. During law school, he spent two years working at the Michigan Supreme Court working for Chief Justice Robert Young. 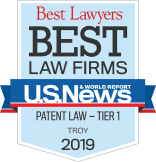 He contributes to the profession as a master in the Michigan Intellectual Property Inn of Court and a council member on the IP Section of the State Bar of Michigan. In 2017, he spoke as a panelist at the AutoLex Automotive Legal Forum in Detroit. The panel discussed managing the IP life cycle, overseeing R&D departments, and fighting trade secret theft in the world of autonomous vehicles. Colin is also a member of the American Intellectual Property Law Association and the Michigan Intellectual Property Law Association.